Homepage. This page: A 1919 sales leaflet published for The International Tyre & Rubber Company's products. 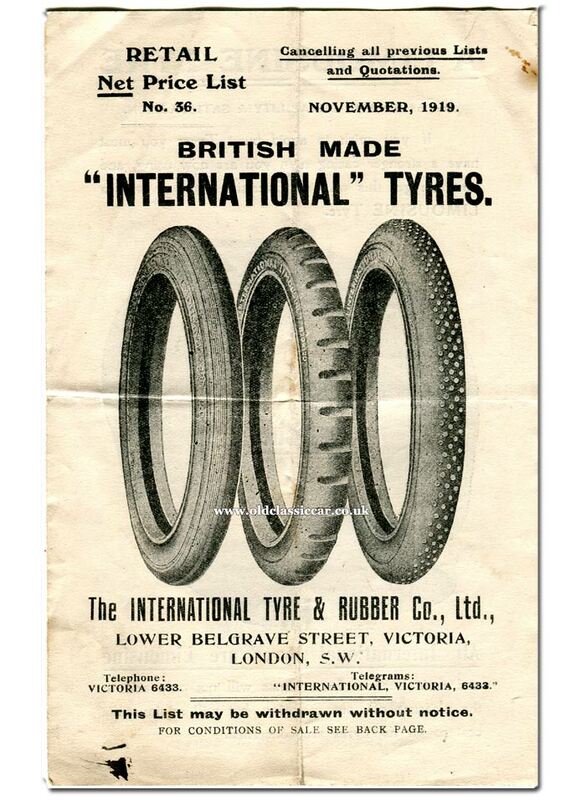 International Tyre & Rubber Company (London). One of the important things to get "right" when it comes to running a vintage car, is the choice of tyre - not just for grip, but also appearance's sake. With punctures commonplace during the early 20th Century, in part due to the poor road surfaces that the pioneer motorists had to contend with, choosing the correct covers was of great importance. 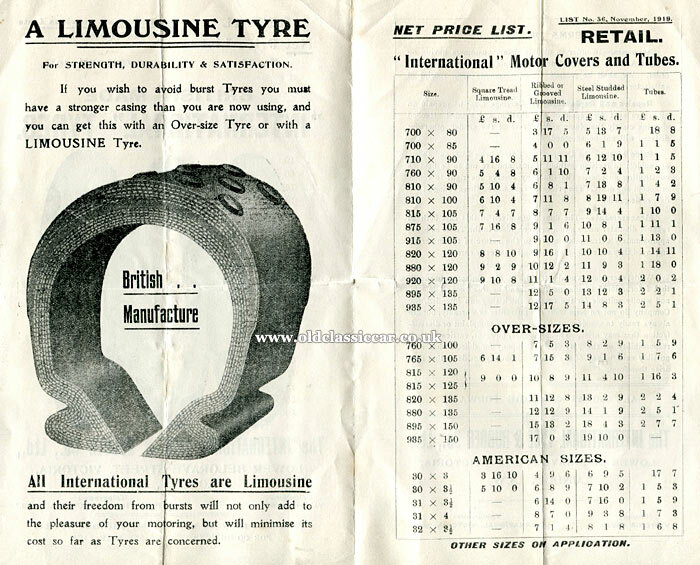 This leaflet dates to November 1919, and comes from one of several manufacturers of car tyres that were plying for business in the vintage era. Here, the products of The International Tyre & Rubber Company are being publicised, with three different tread patterns illustrated. The price list section describes each tyre type as Square Tread Limousine, Ribbed or Grooved Limousine, and Steel Studded Limousine. Each tyre has the company's "International Limousine" lettering on its sidewall. The company was based on Lower Belgrave Street, Victoria, London. "If you wish to avoid burst Tyres you must have a stronger casing than you are now using, and you can get this with an Over-size Tyre or with a LIMOUSINE Tyre." "All International Tyres are Limousine and their freedom from bursts will not only add to the pleasure of your motoring, but will minimise its cost so far as Tyres are concerned." "International" tyres in the following sizes are listed: 700x80, 700x85, 710x90, 760x90, 810x90, 810x100, 815x105, 875x105, 915x105, 820x120, 880x120, 920x120, 895x135 and 935x135. "Over-Sizes" are given as 760x100, 765x105, 815x120, 815x125, 820x135, 880135, 895x150 and 935x150. The following tyre sizes to suit American cars are also listed: 30x3, 30x3.5, 31x3.5, 31x4 and 32x3.5. There are few references to this company's car tyres online, so if anyone can advise on what became of the firm I'd be interested to update the page accordingly. My best guess is that they were taken over by a rival manufacturer at some point. Return to the Motoring Collectables section for more items relating to pre-war cars and garages. For anyone interested in two-wheeled transport matters, and tyres in particular, may find a page describing a Palmer Motor Cycle Tyres booklet from 1913 of interest.